The InterContinental Kansas City culinary team prepare and present scrumptious cuisine with a comfortable, mid-west flair. Specialties include savory steaks, chops, pastas and seafood. They have the flexibility to accommodate the needs of any palate during any meal period while knowledgeable wait staff is prepared to offer suggestions, pairings and details about available items. Beyond the hotel, true foodies will surely discover Kansas City to be a delightfully and unexpectedly first-rate culinary town with eclectic offerings, including - of course - signature KC BBQ. Preview Country Club Plaza dining options here. Or study up on area eateries instead. 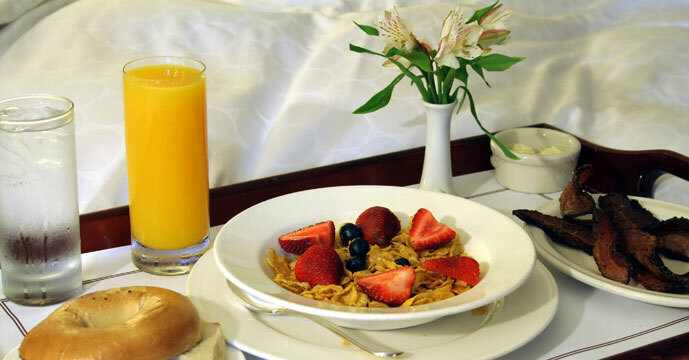 Make InterContinental Kansas City at the Plaza your lodging and culinary destination. Plan your Kansas City escape today. In addition to Starbucks, featured grab ‘n go items include local favorites such as Andre’s chocolates and Parisi pastries. 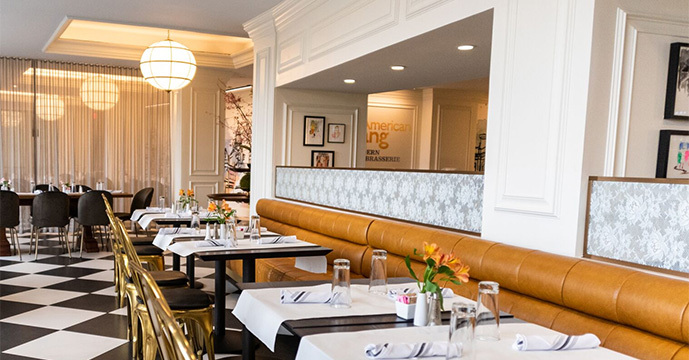 Amidst a robust Kansas City dining scene, American Slang is a totally unexpected fun, vibrant, modern and approachable 200-seat restaurant, 35-seat bar with patio seating featuring spectacular views of the renowned Country Club Plaza shopping, entertainment and dining district. Plus flexible private dining areas are available for special occasions and events from 20 – 100. And live jazz six nights a week in the vibrant Oak Bar. American Slang Modern Brasserie is active in the local community, relevant in the restaurant community and a haven for culinary discovery. With a fresh approach to European/French-inspired cuisine and an American twist on timeless favorites, this is where old world charm meets contemporary design and where ‘local’ collides with ‘European’ in a compelling and engaging culinary way. American Slang is an awesome place to eat on the Country Club Plaza. Come grab a nice lunch, savor a reliable romantic spot to share a glass of good wine or relish a grand gathering place to engage with old friends or meet new ones. Whether you’re worn out from visiting Kansas City’s amazing attractions, mesmerized by the view of the Country Club Plaza from your guest room, want to work uninterrupted in the comfort of your boxers, or maybe you and your special someone just desire a bit of alone/together time? Let us deliver! When pool time also involves sipping and noshing, it’s comforting to know our pool menus offer up several casual, familiar and tasty items…perfect for the setting including nibbles, hot dogs and burgers off the grill, street style tacos, sandwiches, salads and cool sweet things! And, as for beverages, our trendy concoctions complement a variety of beers, wines by-the-glass, frozen drinks and soft drinks. Something special culinarily-speaking is happening nearly all the time at either the hotel or American Slang Modern Brasserie. Culinarians at InterContinental Kansas City at the Plaza – whether involved with the restaurant, pool or banquet/catering/wedding preparation and presentation – are all about food and beverage passion and excellence. Whether selecting produce, poultry, beef, seafood or specialty items or beverage offerings, InterContinental Kansas City’s culinary team vision is to provide a memorable culinary experience for all diners at American Slang Modern Brasserie and in-room dining as well as the hotel’s valued banquet and catering guests. With loads of items and offerings locally sourced. This happens through established relationships with many and diverse local and regional food and beverage suppliers, wholesalers and distributors. And by ‘local,’ we mean vendors within a 150-mile radius! The selection process begins with the products and ingredients themselves. Our culinary team is in lock-step with each resource grower and partner who carefully, and with drive and passion of their own, delivers our food and beverage needs. Of the many local and regional small brewers, distillers, bakers and businesses who were thoughtfully considered, the following are a representative few who were carefully chosen for their commitment to providing hand-selected superior products direct. From the finest charcuteries to cheeses, fine chocolates to high-end coffees, InterContinental Kansas City diners will know their culinary experience will be second to none.